To be quite lawyerly about it…it depends. Steve Dolinsky considered it the only disappointment in last week’s eating tour of big hitter Strip restaurants — not because he didn’t like the crisp, pristine quality of everything tasted, but only because he felt the price-to-value ratio just wasn’t justified. We at ELV both agree and disagree with Steverino. True, it is hard to rationalize a price tag of at least $150/person for raw fish, tiny amounts of meat, and vegetables — no matter how precious they may be — since the inscrutable nature of Japanese food is often lost on the western palate. Japanese food can have a subtlety to it that borders on the invisible. That being said, there is an elusive yet stunning quality to the food here that separates it from any other sushi or sashimi — even that in relatively high-end Japanese restaurants — you have ever tasted. The average American customer — even one used to dining in Japanese restaurants a la Dolinsky — may not taste or get what makes some of these items so special. Neither ELV nor his staff professes any expertise in this area, but we know just enough to recognize the food here as being on a different plane, a higher level, than at any Japanese-American restaurant we have ever dined in. Call it freshness (that old cliche). Vibrancy. All of the seafood has a certain snap to it, combined with almost unfathomable delicacy. 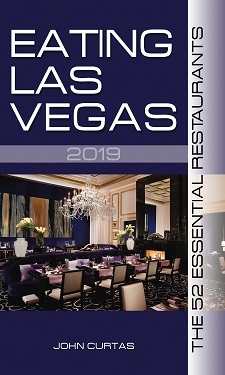 There are contrasts in tastes and textures, plus a depth of flavor in everything from the perfectly seasoned rice to the delicate foams, sauces and accents accompanying the dishes, that beckon and intrigue with every bite. We find ourselves stunned with the interplay of these sensations — which is probably the exact response Masa Takayama is looking to elicit from his customers. So is it worth it? Probably not for most Americans. Steve is right on that score. But if you’re looking to raise your Japanese eating game, and have the money to invest, this is one of only a handful of places in the United States where you can do so. Intriguingly, more than one friend with significant Tokyo experience noted that Bar Masa was even more expensive than the best sushi they’d had in Tokyo. Which makes sense…and also doesn’t make sense. Also, Chef Masa told me, without any reservation, that he won’t be spending much time here. Can a corporate casino afford to give valuable real estate to shrines…and ones that don’t even feel like a high-roller experience (in contrast to Robuchon, Savoy, Alex). Time. Will. Tell. I’m still wondering how they’ll make it in that massive space, but I’ll have to taste for myself soon. Once again ELV you get right to the heart of the matter. 1. Their Toro (even at 15 bucks a piece) is the best sushi you will ever eat. 2. You cant get wasabi cress salad at many other places, and it is heavenly. 3. Ho Ho Shoo sparkling saki is a pretty damn good beverage. Is Bar Masa expensive? F*ck yes. But I look at the cost this way: A mid range Napa Cab or even a stunning Pinot from Oregon is at least 7X more expensive than the quaffable Pinot that Mark West puts out. Even at $30 for two pieces of Toro, Bar Masa’s offering is only 3X more expensive than the toro you can get at I love Sushi. In this regard it is a relative bargain. Bar Masa is a superior eating experience, and sadly given the economic climate, it is doomed to fail. But the food, service and experience are without equal in the Japanese eating realm. BTW ELV I’m having dinner at Bern’s in Tampa tonight. Yum! Any thoughts on the relative value of the $500/person room? Doomed to a quick and ignominious end. Not even whiskey besotted, Japanese high rollers are interested in paying that kind of coin for a meal cooked by underlings of a famous chef who is hardly ever going to be in Vegas. The future of that room, and Bar Masa entirely, will be fascinating to behold. All the great food and great press in the world ain’t gonna fill it up, and as much as we like the vittles, our crystal ball sees it as the first casualty among Aria restaurants…with Union being close behind. Union? Hmmm… I would think they wouldn’t have troubles filling up those Light Group places. But maybe having essentially the same restaurant three properties in a row, they are over saturated? Regarding the $500/person room, skip it. Put it towards your mortgage or a ticket to Tokyo. I will admit that the ingredients are all of high quality and are mostly shipped in straight from Japan. However, I feel like thay are sending them first class instead of under the plane. Furthermore, as so few can afford the place, you can’t help but feel like you are being watched by the numerous waiters while you eat in this huge empty room. Every word you utter, every slurp, bite , and chew, you’re on display. My favorite part was the japanese apple. It was so good I asked for another order (3 thin slices). 3 bites and $518 plus a $100 tip/person and I was on my way.